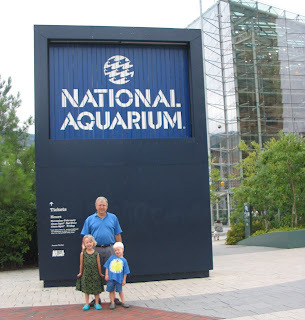 For Bryce's 4th birthday, we were able to forgo a party again and we went with family to the Aquarium. We'd never been with the kids and Bryce is super into sharks, so we figured it would be a great day. We were right! My dad, brother in law, and IL's joined us for the Aquarium and then we went back to my parents' for food/cake/ice cream and to just hang. The kids swam and Bryce had a jolly time opening gifts. My poor mom, who was there in body, pretty much missed the day because after having major wrist surgery on Thursday, she was in a lot of pain and needed a lot of pain meds, so she slept a good bit of it. I know I felt like she wasn't there and so did she. But thankfully, we got to catch up with her later in the week. My favorite quote of the day was as Bryce was opening his gifts, he got very excited about some pirate Legos and a few other items and then he opened the gift bag containing a few fall outfits. "Hey! Clothes aren't exciting!!!" All the adults got a big laugh out of that but that turned around quickly when he opened a few more "exciting" gifts from other people. He made out pretty well with a bunch of Legos, a Ravens jersey, a Terps jersey, some shark books, fall clothes, and walkie talkies! And as usual, he shared his birthday with my sister who has a birthday 2 days after him. She had peach pie and he had cake and we all shared homemade peach ice cream! A good day although the next day I was hurting because of staying up so late cooking on Friday and then carrying Piper around in the Ergo for 3 1/2 hours (21 lbs! ), really wore on me. I really should put her in that thing and carry her around more often. I could probably lose a lot of weight that way! YAY for the dolphin show!